The UT Lake Erie Center is teaming up with Barefoot Wines and the Alliance for the Great Lakes to host a public Adopt-a-Beach cleanup Friday, Aug. 3, at Maumee Bay State Park in Oregon, Ohio. Some volunteers from last year’s Adopt-a-Beach cleanup posed for a photo. “Cleanup efforts like this are a great way to increase public awareness about the value of the Lake Erie ecosystem and the importance of caring for it,” said Meredith Gray, UT communications and technology specialist at the Lake Erie Center. The cleanup will take place from 4 to 6 p.m. at the Maumee Bay State Park Beach followed by a free celebration party sponsored by Barefoot Wines inside the Maumee Bay Lodge and Conference Center until 8:30 p.m. The celebration is open to those 21 and older; it will include music, food and drinks. The Adopt-a-Beach program helps clean up Great Lakes’ beaches and shorelines with a special celebration recognizing volunteers’ efforts. 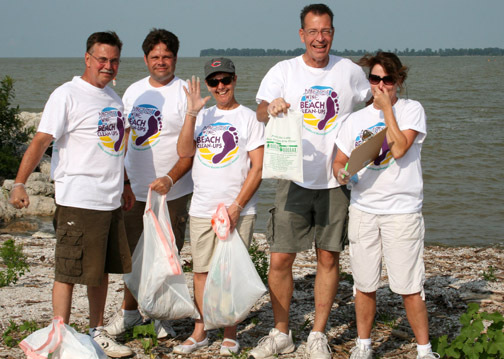 In 2011, more than 8,000 Adopt-a-Beach volunteers removed 32,668 pounds of trash at 254 locations in Illinois, Indiana, Michigan, New York, Ohio and Wisconsin. Gray encourages members of the University community to volunteer to assist the Lake Erie Center with its mission to engage the community in environmental education, sustainable living, and informed outreach awareness programs through the fun Adopt-a-Beach program. For more information, visit www.greatlakes.org/adoptabeach or facebook.com/lakeeriecenter. Gray can be contacted at meredith.gray@utoledo.edu or at 419.530.8361. Students Austin Tuttle and Regina Jankowski, wearing safety harnesses, get face time with the Commodore in Perrysburg. Commodore Oliver Hazard Perry, hero of the 1813 Battle of Lake Erie and famed for his laconic report of victory — “We have met the enemy and they are ours” — was facing a danger beyond even his skills of martial seamanship. The damaging pollution had taken the sheen from the memorial statue of Perry that’s long been a landmark of his namesake city. Providentially, Tom Lingeman, UT professor of art, saw the sculpture’s deterioration as an opportunity. “I’ve wanted the Department of Art to become involved in the conservation of outdoor sculptures for some time, and being that the Perry monument is such an integral community asset, the timing seemed perfect,” Lingeman said. Working with the city and the Perrysburg Area Arts Council, he offered students in his sculpture class an experience unique at the University. “We went, we conquered, we washed and waxed,” said Tracey Steils, a 1997 UT art education graduate who’s taking Lingeman’s class to continue her education. 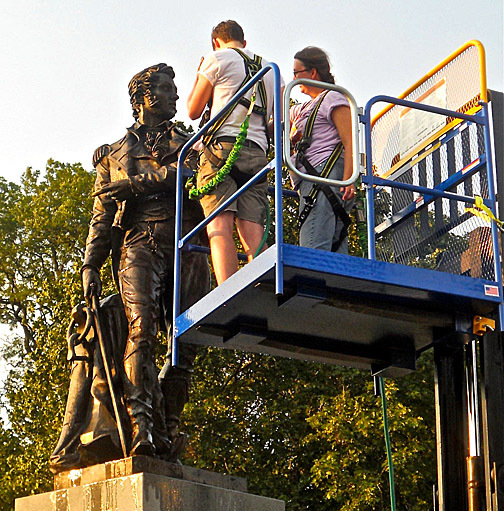 Thanks to Perrysburg’s loan of a forklift and operator, Steils and other students could examine the bronze sculpture before cleaning it with water and a special soap. After drying over the weekend, Perry and the two figures along the monument’s base — a midshipman and a cabin boy — were coated with conservation-grade wax that should protect them for at least a year. Plans are under way for a yearly conservation visit, Lingeman said. To expand the art curriculum, Lingeman hopes to create a certificate program in conservation, specializing in outdoor sculpture — which abounds in the area, he noted. His students are gearing up to treat two pieces on the UT Health Science Campus, works of the late sculptor and UT alumna Joe Ann Cousino. The University of Toledo College of Business and Innovation recently presented its 15th annual Human Resource Management Awards to four area companies: Diamond Crystal, Fresenius Medical Care, StyleCrest Enterprises and Winzeler Stamping Co.
“Even in challenging economic times, progressive companies that truly care about their employers rise to the top and find a way to succeed and grow,” said Dr. Clinton Longenecker, UT professor of management and chair of the awards selection committee. “As local residents think about jobs, it is important to recognize these area success stories, the area’s best employers who are taking steps to attract and retain the best people. They are leveraging their employees to make a difference and, as a result, they make a significant economic impact. • Diamond Crystal, Perrysburg, Ohio, a food service company. “The best part about being in HR here is helping my employees,” said an HR administrator. “I love to see the gratitude on their faces when we help them go through any situation. Longenecker said among the reasons Diamond Crystal was recognized with a Human Resource Management Award for Excellence was for providing organizational leadership in establishing human resources as a key team member of the management team; improving labor/management relationship by creating a team-based approach to workplace improvement and performance enhancement; and reducing the total number of workplace grievances and arbitrations to zero. • Fresenius Medical Care, Toledo. Longenecker explained that among the reasons Fresenius was recognized with this award was for developing and implementing a quantifiable HR contribution system; bringing the HR function to the strategy table; and displaying innovation through creating and equipping a benefit self-service function. • StyleCrest Enterprises, Fremont, Ohio, a distributor of building products for housing and manufacturing. “Our people are behind us, I think, because of our commitment to them,” one administrator said. “They are associates, not employees. We try to engage them, hold them accountable and responsible, but we’re also kind of a family. Longenecker said Stylecrest was recognized for developing a value-added recruitment strategy and state-of-the-art selection process; creating health-care and risk management strategies that ensure the health and safety of their work force; and engaging in a collaborative culture change and new manager and supervisor development programs. • Winzeler Stamping Co., Montpelier, Ohio, a manufacturer of parts for the hardware and automotive industries. “Sometimes it’s second or third generation working here. The Winzelers are leading us as employees; they care about people and, in turn, we care about each other. Winzeler people understand that they are important to the organization,” said an administrator. “When you think about the quality of the work our people do here, a lot has to do not just with what they have learned, but we hope to instill in them the values, know-how and develop them however possible to get the product out so that our customers will want to buy it, and that means success for everyone,” another administrator added. Longenecker said Winzeler was recognized with this award for having exceptionally strong organizational commitment to employee safety and health; creating HR leadership in strategic decision making; implementing a comprehensive wellness program called HealthPerks 2012; and providing ongoing education and support to employees. Longenecker said the HR Management Excellence Awards were established in 1998 by the UT College of Business and Innovation Department of Management to encourage and recognize excellent progress and achievement in the field of human resource management among area organizations. An administrative delegation of 19 leaders from China’s Zhejiang University of Finance and Economics (ZUFE) visited The University of Toledo for nine days earlier this month. 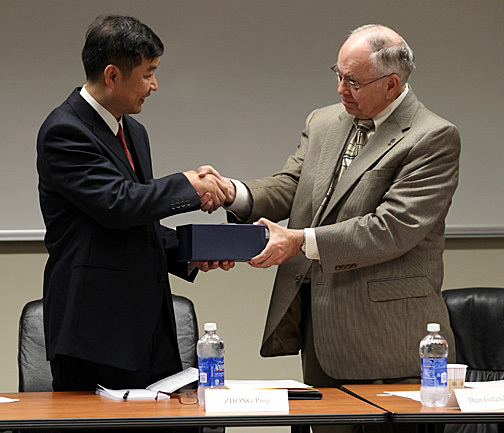 Dr. Thomas Gutteridge, dean of the UT College of Business and Innovation, right, gave a gift to Ping Zhong, commissioner of the Division of Political Administration at Zhejiang University of Finance and Economics. The two exchanged presents during the Chinese delegation’s recent trip to campus. The July 9-17 visit was sponsored by the UT College of Business and Innovation and the UT Center for International Studies and Programs. “It is wonderful to host this group of administrators from our counterpart business school in mainland China to share perspectives on student development, the integration of theory and practice, and the tremendous value of collaboration,” said Dr. Thomas Gutteridge, dean of the College of Business and Innovation. An initial agreement that established a framework for program collaborations between ZUFE and UT was signed in 2008. ZUFE has an undergraduate program of management in accounting with a concentration in U.S. accounting on its Hangzhou campus, a curriculum that connects with the master of science in accounting degree program offered by the College of Business and Innovation. ZUFE faculty members have visited the UT College of Business and Innovation in the past to learn more about the academic and business environment of this area, but this was the first visit of an administrative delegation. 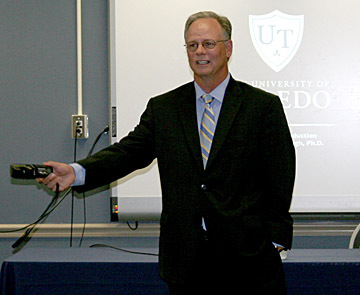 During the visit, the delegation met with UT faculty and students; observed a Rocket Launch freshman orientation program; participated in a panel discussion about higher education in the United States with several UT administrators; visited the Toledo Museum of Art; and observed and audited business classes. Zhejiang University of Finance and Economics was established in 1974 and currently has more than 20,000 students. 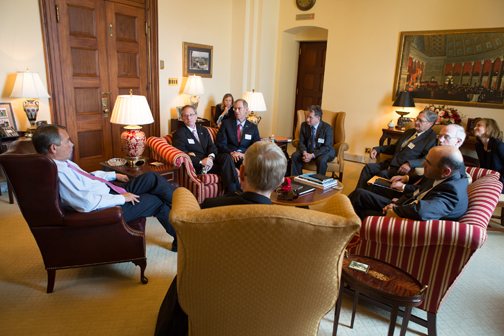 Speaker of the House of Representatives John Boehner, left, spoke with UT President Lloyd Jacobs, Dr. Jeffrey Gold, and leaders from other Ohio medical schools during a July 19 meeting in Washington, D.C. Seated with his back to the camera is Dr. Francis Collins, director of the National Institutes of Health. 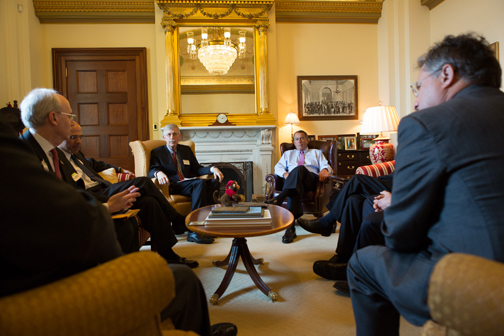 University of Toledo leaders met July 19 with Speaker of the House John Boehner and National Institutes of Health Director Dr. Francis Collins to discuss the importance of medical research to UT and other institutions across the state and the country. President Lloyd Jacobs and Dr. Jeffrey Gold, chancellor and executive vice president for biosciences and health affairs, and dean of the College of Medicine and Life Sciences, joined several leaders of other medical schools in Ohio to talk about the economic and health-care impact clinical research funded by the NIH can have on society. “The line item in the federal budget that funds the National Institutes of Health is responsible for so many of the scientific and medical breakthroughs that treat and cure diseases and conditions that in the past caused great pain and suffering,” Jacobs said. Boehner, center right, and Collins, center left, spoke with the group about medical and scientific research and the role the NIH can play in funding those efforts. Gold, who serves as chair of the Ohio Council of Medical School Deans, announced in late May that the state’s medical colleges and teaching hospitals had an economic impact in excess of $42 billion in 2011 alone. Olivia Ruffner, 10, is working to raise $1,000 to support cancer research at The University of Toledo in honor of her uncle. Olivia Ruffner is not your ordinary 10-year-old girl. She has set out on an ambitious goal to raise $1,000 for cancer research in honor of a family member by selling donated items and collecting donations at the Commodore Way flea market in Perrysburg. In just one week, she’s already raised more than $650, and so many people have donated items for her to sell that her family is beginning to run out of space to store it all. “It’s kind of growing out of hand, but I think that really speaks to the generosity of everyone who has donated,” said Jim Delph, Olivia’s grandfather. Last Sunday, Olivia worked at the flea market all day beginning at 6:30 a.m. She’s also spent countless hours making signs, sorting through donated items, and setting up her fundraising tent. She’s doing it all because of someone she loves. “My uncle has brain cancer, and I thought that something needed to be done for him,” Olivia said. Her uncle, Mike Glanville of Powell, Ohio, was diagnosed with cancer 16 months ago. At the age of 49, he has undergone four surgeries, the last of which was July 23. Glanville is a graduate of The University of Toledo, which is where Olivia decided the money raised would be donated. The donations will support the Cancer Biology and Biochemistry Fund at The University of Toledo College of Medicine and Life Sciences. Olivia researched her decision by taking a tour of one of the UT cancer research labs under the direction of Dr. William Maltese, UTMC professor and chair of biochemistry and cancer biology. 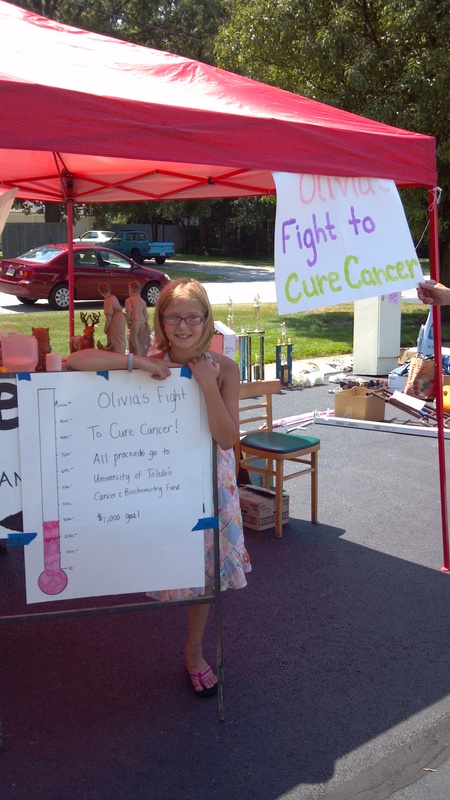 Olivia hopes to reach her $1,000 goal by Sunday, which is her last day for fundraising because of all her other hobbies and activities that she has commitments to. This week, she’ll be showing her rabbit at the Wood County Fair and working the 4-H milkshake stand. Olivia’s efforts also were promoted by The Blade’s local news Our Town Perrysburg website. Although the fundraising tent will be closed after Sunday, donations will continue to be accepted through The University of Toledo Foundation designated for the Cancer Biology and Biochemistry Fund. Checks can be mailed to Linda Clagus at the UT Foundation, 2801 W. Bancroft St., MS 319; Toledo 43606. A construction project to enclose the outside plazas between the Health Education Building and the Orthopedics Center and between Dowling Hall and the Orthopedics Center on the UT Health Science Campus will require the closure of a number of walkways and doors through the end of the year. Construction will begin Monday, July 30 closing the exterior walkway between Health Education and the Orthopedic Center, as well as the exterior doors on the west side of the Health Education building and both exterior doors to the connector to Dowling Hall and the Orthopedic Center. The main entrance to the Orthopedic Center will remain open and a temporary entrance to Dowling Hall will be created across from that entrance. Additional closures are planned starting Aug. 6, including doors on the first and second floors that connect the Health Education Building to Dowling Hall through the atrium. The second floor walkway from the UT Medical Center also will be closed at the atrium connector between Health Education and Dowling. The closures are anticipated to last through Dec. 31. The Toledo Baseball Dugout Club will hold its annual alumni golf outing Friday, Aug. 17. The event will be held at the Bedford Hills Golf Club with a shotgun start beginning at 1 p.m. Individuals may form their own foursome or be placed in one. The entry fee for the outing is $100 per person (graduated prior to 2008) or $75 (graduated between 2008 to 2012) with all proceeds going to the Rocket baseball program. The fee includes use of the driving range prior to the event, a participation gift, pre-golf lunch, golf and dinner. Head Coach Cory Mee is offering opportunities for hole sponsorship for the outing for $100. Anyone can sponsor a hole; this includes individuals, families, businesses and teams. The 10th-year skipper is asking golfers to RSVP by Friday, Aug. 10. For more information on the golf outing, call Mee at 419.530.6263. Toledo tied a program best with five baseball players being named to the 2012 Academic All-MAC Team, as voted by faculty athletic representatives at the Mid-American Conference institutions. The Rockets, who also had five honorees in 2007, tied Eastern Michigan for the most academic recipients and are represented by senior Joe Corfman, junior Ben Hammer, junior Matt Delewski, sophomore James Miglin and sophomore Ryan Wilkinson. Corfman becomes only the second player in school history to earn academic all-league accolades on three occasions, joining former Rocket Rich Molnar (1980-83). Hammer and Delewski are two-time selections, while Miglin and Wilkinson are first-time recipients. The Academic All-MAC honor is for a student-athlete who has excelled in athletics and academics. To qualify, a student-athlete must have at least a 3.20 cumulative GPA and have participated in at least 50 percent of the contests. First-year students and junior college transfers in their first year of residence are not eligible for the award. A total of 21 student-athletes were named to this year’s squad. The number of honorees on the MAC All-Academic Team is set for the specific sport or 33 percent of the number of nominees, whichever is greater. The remaining student-athletes have been recognized as Academic Honor Roll selections. A marketing and finance major with a 3.753 GPA, Corfman led the 2012 MAC West Division Champions in six offensive categories this spring — hits (78), runs scored (52), doubles (16), total bases (102), stolen bases (22) and hit by pitches (11). The first-team All-MAC honoree ranked third in the league in thefts, tied for fifth in runs scored, tied for seventh in hits, and tied for 10th in two-base hits. One of two Rockets to start every game (52 at second base, five at third base), he hit safely in a team-high 43 contests, including a squad-best 24 multi-hit efforts. Corfman also reached base in 52 of the 57 games and finished a close second on the squad in batting average (.333). 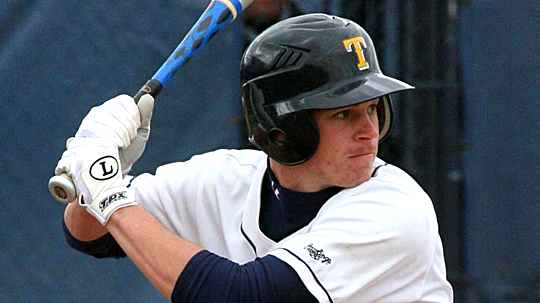 Corfman collected 261 hits in his time donning the Midnight Blue and Gold, surpassing former teammate Chris Dudics (254, 2008-11) for the top spot in school history. The Richfield, Ohio, native also wrapped up his illustrious career first in UT annals in doubles (54), second in runs scored (177) and total bases (375), tied for fifth in RBI (134) and 10th in batting average (.329, 261 for 794). In the Toledo single-season record book, Corfman ranks second in runs scored (69, 2010), tied for second in doubles (20, 2010) and RBI (61, 2010), third in hits (88, 2010), fifth in total bases (131, 2010), tied for sixth in doubles (16, 2012), seventh in hits (78, 2012) and tied for seventh in stolen bases (22, 2012). Academically, Corfman has been a member of UT’s dean’s list each of the last eight semesters. An exercise science major with a 3.875 GPA, Hammer batted .257 (58 for 226) with 23 runs scored, eight doubles, two home runs, a team-high 34 RBI and nine stolen bases. The Wayne, Ohio, native started all 57 games in center field and hit safely in 38 contests, including 14 multi-hit and six multi-RBI efforts. Hammer finished first on the squad in sacrifice flies (5), tied for first in games started and sacrifice bunts (8), second in hits and walks (23), tied for second in multi-hit efforts, third in thefts, tied for fourth in multi-RBI games (6), and fifth in runs scored and total bases (72). The two-time first-team Academic All-District recipient has been a member of UT’s dean’s list the last seven semesters, including a perfect 4.0 GPA in six grade periods. An exercise science major with a 3.449 GPA, Delewski hit a sizzling .340 (34 for 100) with 12 runs scored, a team-high nine doubles and 17 RBI in MAC play this spring, en route to earning second-team all-league recognition. He finished tied for fifth in two-base hits in conference games. Overall this spring, Delewski batted .306 (53 for 173) with 16 runs scored, 11 doubles and 20 RBI. The Maple Heights, Ohio, native started 44 of 51 games (42 at designated hitter, two at first base) and hit safely in 37 contests, including 13 multi-hit and four multi-RBI efforts. The 2010 first-team All-MAC honoree finished third on the squad in batting average, tied for third in doubles and sacrifice bunts (7), and fifth in hits, on-base percentage (.349) and multi-hit efforts. Academically, Delewski has been a member of UT’s dean’s list the last four semesters. An exercise science major with a concentration in pre-physical therapy and a 3.899 GPA, Miglin hit .274 (54 for 197) with 29 runs scored, seven doubles, five home runs and 33 RBI this spring. The 2012 first-team Academic All-District recipient started 52 of 53 games (47 at catcher, five at designated hitter) and hit safely in 36 contests, including 14 multi-hit and seven multi-RBI efforts. Defensively, Miglin threw out 19 of 54 (.352) potential base stealers. Academically, Miglin has been a member of UT’s dean’s list the last four semesters, including a perfect 4.0 GPA in spring 2011. A civil engineering major with a 3.855 GPA, Wilkinson was outstanding as the Friday starter the last eight weeks of the 2012 campaign. He compiled a 5-2 ledger with a 2.50 ERA in MAC games, giving up 14 earned runs (23 runs total) on 53 hits with 36 strikeouts in 50.1 innings of work. The 2012 second-team All-MAC recipient finished tied for fourth in wins and shutouts (1), ninth in ERA, and tied for ninth in complete games (1) in league play. Overall this spring, Wilkinson sported a 7-4 mark with a 2.99 ERA and one save. He has accumulated 78.1 innings of work, surrendering 37 runs (26 earned) on 86 hits with 50 strikeouts. He worked at least 6.0 frames in five of his 11 starts and finished tied for fourth in the MAC in wins, tied for fifth in shutouts (1) and sixth in ERA. The second-year letter winner sits third in UT annals in career fewest walks per inning (.243, minimum 100.0 frames), fifth in ERA (2.70, minimum 100.0 frames) and eighth in win percentage (.688, 11-5). He also is tied for fourth in school history in total appearances (25, 2011) in the single-season record book. Academically, Wilkinson has been a member of UT’s dean’s list the last four semesters. This quintet played a key role in helping Toledo claim its first MAC West Division title in school history in 2012. The Rockets’ 19-8 (.704) MAC record equaled their best mark since the conference went to three-game series prior to the 2004 campaign. Overall this spring, UT sported a 30-27 mark, registering its second 30-win season under Head Coach Cory Mee. Toledo also secured a spot in the MAC Tournament for a school-record fourth-consecutive season. The third candidate for provost and executive vice president for academic affairs held an open forum Tuesday, and a fourth candidate will visit campus next week. Dr. Scott Scarborough, senior vice president and executive director of UT Medical Center, gave a detailed presentation at his forum in the Student Union about his background and how he would lead academic operations on UT’s Main Campus. The fourth candidate, Dr. Antonio Moreira, vice provost for academic affairs at the University of Maryland, Baltimore County, will participate in a forum open to all internal and external constituents Monday, July 30, at 10 a.m. in Student Union Room 3018. Scarborough, who has been with UT since 2007 when he accepted the position of senior vice president for finance and administration, discussed his track record of building teams and leaders to move institutions forward with strategic investment. “I’m not looking to be everything the organization needs, but what I am committing to is developing a team that is everything the University needs,” Scarborough said. He joined UT from DePaul University. Prior to that, he worked for the University of Texas System for 10 years. Scarborough said his financial background and knowledge of the budget concerns facing higher education are an example of a nontraditional outlook that could benefit the provost’s office. He answered questions about the importance of the humanities, studying the morale of the institution, and his previous relationship with a private online education company. Moreira, the fourth candidate for provost, has been with the University of Maryland, Baltimore County, since 1990 when he joined the faculty as director and professor of the Chemical and Biochemical Engineering Program. Moreira also has served at the institution as associate provost, associate dean of engineering and department chair. He has held teaching and research positions at Colorado State University, the University of Waterloo in Ontario, Canada, and the University of Oporto in Portugal. Moreira also has worked for Schering-Plough Corp. in Union, N.J., and International Flavors & Fragrances in Union Beach, N.J. The other candidates for provost are Dr. Carlo Montemagno, dean of the College of Engineering and Applied Science at the University of Cincinnati, and Dr. Janine Janosky, vice president at Austen BioInnovation Institute in Akron. The person selected as UT’s next provost and executive vice president for academic affairs will succeed Dr. William McMillen, who is retiring after 30 years with UT and Medical College of Ohio/Medical University of Ohio. Feedback about the candidates for provost can be sent to Joel Epstein, executive search consultant with Waverly Partners LLC, at jepstein@waverly-partners.com and UT President Lloyd Jacobs at Lloyd.Jacobs@utoledo.edu.